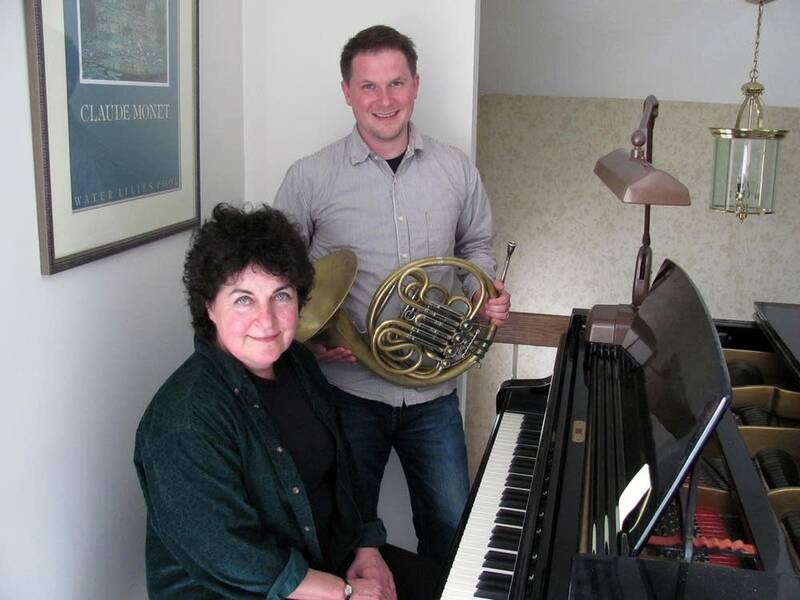 Throughout French horn virtuoso Bernhard Scully's career, his mother, Bloomington pianist Joanne Minnetti, has been in his shadow — as his accompanist. Now the pair are sharing equal billing on their first full-length album, entitled "Dialogues en Francais." The music reflects a mother and son artistic partnership that dates back to when Scully was a child. Joanne Minnetti is a gifted pianist and piano teacher. Her son, Bernhard Scully is a French horn player extraordinaire. The adage about coming from a musical family truly applies to Scully. From the time he was in the womb, he was enveloped in orchestral music, chamber music, symphonies, concertos and piano, piano, piano. Both his parents played piano, and taught it from the college level on down. That is what he was surrounded by, in addition to the cornfields on the edge of Vermillion South Dakota where he grew up. His friends may have thought it was weird that Scully had the great composers and their masterworks on the tip of his tongue the way they had memorized the U.S. presidents, but that was Scully's upbringing. "I assumed it was normal for people to hear piano music constantly, and "Lightly Row" to be like played 5,000 in a day," Scully said. "Lightly Row" is a standard Suzuki piece for beginning piano students. Both nature and nurture pointed Scully in the direction of becoming a top notch musician. The question at first was what instrument? The piano gave him a 'been there done that' feeling. After picking up the violin for a few years then putting it down, Scully settled on the French horn, with great enthusiasm as Minnetti recalls. "I never made him practice," she said. "I mean, he just did it. In fact, when he got really serious about it was more like, 'OK, here's a timer, Bernhard. This will tell you when to stop practicing." Scully's innate talent and the fervor with which he embraced the French horn made him a prized performer in a short amount of time. Soon he was traveling the student recital and competition circuit with his mom at his side, accompanying him. Once, when they had to make a recording for a performance, both Minnetti and Scully had an epiphany. "The final product came out really well and I'm thinking 'Wow, this sounds really good,' " Minnetti said. "My brain started to churn," Scully said. "I started thinking, 'Hey! This is working! We're a team!' "
"It was more like playing with a colleague than it was like playing for a student," Minnetti said. Over the years, that musical bond only deepened. After stints with the St. Paul Chamber Orchestra and the prestigious Canadien Brass, the 35-year-old Scully is now a horn professor at the University of Illinois in Champaign-Urbana. He is also recognized as one of the premier French horn players in the country. Minnetti, 61, teaches piano at two Twin Cities music schools and is known for her work with special-needs students. In 2009, Scully, with his mother performing alongside him, became the first classical brass player to win a McKnight Fellowship. Eventually, he and his mother decided to use the grant money to make their first album. "Dialogues en Francais," features the two musicians immersed in some of the most revered music for French horn and piano, written, appropriately, by French composers. Minnesota Orchestra trumpet player Charles Lazarus, who helped produce the recording, says it contains some 20th century compositions which greatly expanded what was possible on French horn. "These pieces were written with the intent that only the greatest virtuosos could truly have command of such daunting works," he said. But at the center of the collection is a series of six pieces by composer Charles Gounod, entitled "Six Melodies." They allow Scully and Minnetti to showcase their musical relationship. "What we really like about them is this dialogue aspect to them, meaning the piano is really featured equally to the horn, and it's just a beautiful conversation between the two instruments," he said. "There are so many possibilities as how these pieces could be interpreted, Minnetti said. "And I'm thinking, 'well, I'm kind of going out on a limb here, but I like it.' "
Minnetti said she took risks in the way she would "phrase something, or change the tempo slightly, or just do my own thing." Minnetti;s ability to listen and respond to her son's playing, as if they're talking musically to each other, is one of the album's strengths, according to Lazarus. "Joanne may take a melody from Bernhard. He'll pass it off, and she'll play in the same style and with the same shape that Bernhard does," he said. "And then they play off each other and just continue that line going back and forth. Listeners will just naturally listen to the phrasing and maybe forget which instrument is actually playing." For Scully, there's also an instinctual, emotional communication happening in the music that could only come from mother and son. "Absolutely," he said. There's something very special when mom and I sit down and play. It's almost like we can just read each other's minds, when we play." Scully and Minnetti are planning recitals in support of "Dialogues en Francais." They also intend to make another recording with money still left over from Scully's McKnight Fellowship. What excites them the most is making a recording their family will treasure: of two immensely skilled musicians who happen to be mother and son, playing their hearts out.